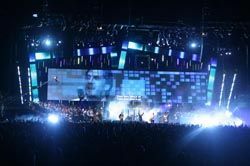 Following the success of the Colour Your World Conference in March, Mandylights' Greg Yates was again behind the drawing board and then the lighting console for Australia's largest conference - the Hillsong Conference, which saw an abundance of Martin gear in use including the new semi-transparent LC series video screens. Working off a concept sketch and a brief to have some LED archways and "forests" of lights, Greg went searching for the product to achieve the vision. The LED archways were the easy one; the new Martin LC panels were the obvious solution, especially since they had to be hung on an angle. These were fed content from a Martin Maxedia media server system; standard library images as well as clips collected by Hillsong over the years. "The LC panels were great," said Greg. "I used 32 of them and they looked really good. The resolution on them was not too high and not too low. You could still write text and have good definition yet also have them as background with patterns or graphics and they looked good too." For the forest of light Greg was looking for something more than a light globe on a cable. He was after something that would change color, dim and be 'sparkly.' Looking around he came up with the solution to use Pulsar ChromaStrips. "The ChromaStrips were fantastic, probably the best little find that I've had in a few years," commented Greg. "I never really knew that they existed until I was doing some work with Rohan Thornton and mentioned that I wanted something sparkly that could hang in space and he suggested the ChromaStrips. I knew straight away that they were the answer." The rig consisted of around 6 MAC 2000 Profiles, 20 MAC 2000 Washes, 18 MAC 700 Profiles, 20 MAC 700 Washes, 18 MAC TW1 washlights, 16 ChromaBanks, 70 ChromaStrips, 24 ChromaCans, 4 VL 1000 TS, and 6 VL 3000 Spot as well as conventional profiles and Fresnels. Control was via an MA Lighting grandMA controlling twelve streams of DMX. Four Look Solution Unique hazers supplied atmospherics. Lighting was provided jointly by Lots of Watts and Chameleon.